Prabal series squirrel cage/slip ring Crane duty motors are specially designed for service on cranes and hoists. They can also be used for similar applications such as material handling equipments, and cranes of all types. These motors can serve as auxiliary motors in rolling mills or wherever intermittent duty drives are required. These are duty type rated motors developing high starting torque with low starting current. The motors are suitable for frequent starts/ stops and reversals. Also rapid acceleration is achieved by high pull out torquelrotor inertia ratio. Manufacturing range for cast iron slip ring crane duty motors is from 112 to 400 frame. The same for squirrel cage motors in cast iron enclosure is from 80-400 & in aluminium enclosure is from 63-160. Squirrel cage crane duty motors are supplied with horizontal foot- mounting. However, motors suitable for foot / flange / face mounting or any combination of these with vertical or horizontal orientation can be offered when required. Slip ring motors are normally available with foot mounting Flange mounting can be supplied on specific request. Crane duty motors are suitable for 3 phase supply and can be wound for any single voltage from 220 to 650 volts and frequencies from 50 Hz or 60 Hz. The rotor voltage is committed for stator supply of 415 V, 50 HZ.For other supply conditions, Rv to be confirmed from CG. The motors are rated at 45Â°C ambient temperature. For temperatures, other than 45Â°C, a deration factor has to be applied as indicated below. and they comply with the following standards (latest versions). For detail dimensions, please refer drawings on page 31-37 in this publication. Made of high quality cast iron conforming to IS:210, ribbed externally to ensure maximum heat dissipation. All components are machined on CNC machines ensuring concentricity and correct alignment. The windings and working parts are completely enclosed and air is forced over the stator body by fan, mounted on the shaft and protected by a cowl. The feet are integrally cast with the body. This ensures sturdiness and resistance to vibrations. Both the stator and rotor cores consist of low loss and high permeability steel stampings which are assembled under pressure and rigidly secured by end plates. Standard crane duty motors have IP55 degree of protection as per IS:4691. IP 56 & 66 can be provided on request. The cooling code of motor is IC 411 as per IS:6362. The shaft is of high grade steel and of appropriate diameter to withstand the bending and torsional stresses. All shafts are ultrasonically tested for any minor flaw in the material. Shafts are machined to extreme fine limits to ensure fit and interchangeability of bearings. The motors are provided with single shaft extension. 2) taper shaft, with threaded end, and with hexagonal nut and lock washer. 3) double shaft extensions, (cylindrical & taper) are available on request. Motors are provided with deep groove ball bearings. They are mounted with extreme care in dust proof housing. 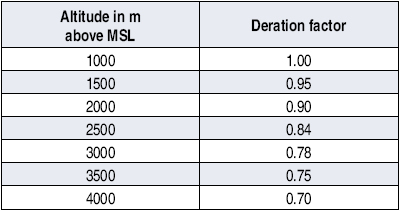 (Refer bearing size table for details). Sealed bearings are provided for motors upto frame 225M. Grease lubricated bearings are used on frames 250 and above. The correct amount of grease is filled in the bearings during manufacturing. On line greasing facility is provided for 250 frame & above to facilitate greasing of bearings without dismantling the motor. For provision of insulated bearings, please refer to CG. Terminal box is provided with IP55 degree of protection. The box can be turned through 3600 in steps of 900 to give cable entry from anyone of four positions. The terminal boxes are suitable for BS screwed conduit. However, fittings like double compression type cable glands are available on request. All sliprings are made of cupro-nickel. The slip ring unit is having high insul~tion resistance ensuring minimum wear and breakdown. The brush holders are assembled as a complete unit which can be easily replaced. The slipring enclosure is dustproof & has a cover with accessibility for inspection. The slip rings are epoxy moulded / fabricated type as per requirement. For large no. of starts, it is necessary that the accelerating time of the system should be as small as possible. For this purpose, total inertia of the system (motor GO sq. + Load GO sq.) should be minimum. Motor GO sq. value and permissible load GO sq. are indicated in the tables. All Prabal series crane duty motors are built to standardised designs and all spare parts are interchangeable. Prabal series crane duty motors with higher class for stator insulation (class H) can also be offered on request. Stator winding (and rotor winding in case of slipring motors) consists of enamelled copper wire impregnated with superior quality class F varnish which is rigid at all working temperatures. Stators in motors with frame 280 & above are manufactured with vacuum pressure impregnation process as a standard. All rotors irrespective of frame size are processed with vacuum pressure impregnation. This gives added electrical & mechanical strength to the winding for high number of starts. The varnish has a high insulation resistance and excellent resistance to moisture, saline atmosphere, acidic/ alkaline fumes, and also to oil and grease. The insulation gives complete reliability under all atmospheric conditions, including humid tropical climates. Stator and rotor wound packs are subjected to surge test before impregnation. Rotors of slip ring motors are wound and impregnated similar to stator windings. In addition, rotor windings are braced with resiglass banding. This gives protection against centrifugal forces experienced by overhang during overs peed and frequent reversals. Gelcoat is provided on the winding overhang for better consolidation and protection from vibration. Strip wound rotors are provided on frames 355 and above. The terminals are mounted on a moulded base and are enclosed in a box having an inspection cover. In case of slip ring motors, three terminals for stator and three terminals for rotor are terminated in terminal box with adequate creepage and clearance. The rotor terminals are in the same box as those of the stator. Separate terminal box for rotor terminals is provided for NDW355LX & NDW400LX frames. This simplifies wiring and maintenance. One earthing terminal is provided in the terminal box and two terminals on mounting feet. Space heaters are used for avoiding accumulation of moisture/water in humid atmospheres. In motors upto 200 frame size, motor windings can be heated up to keep winding temperature above ambient by 5 to 10 degrees, by giving low supply voltage upto 10% of rated voltage. Supply voltage is to be adjusted by keeping 20-25% rated current. Thermal protection: Stator windings can be provided with PTC thermisters for alarm/trip or PT 100 type resistance temperature detectors according to the accessories table provided. 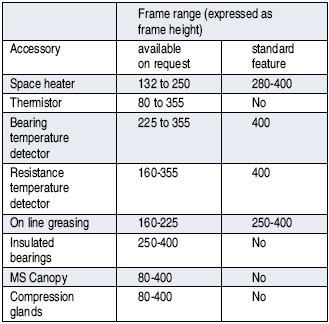 Bearings can be provided with PT100 type resistance temperature detectors as per enclosed table 6. The rotor voltage of the motor is kept such that the insulation of the rotor and of the associated switchgear is not unduly stressed during rapid plugging when rotor voltage can rise to 2 to 3 times the rated value. Rotor voltage for slip ring motors is as per performance tables enclosed. Special rotor voltage can be offered for wire wound rotors with confirmation from CG. The pull out torque value at rated voltage is indicated in the respective tables. Since available torque varies as the square of the supply voltage at motor terminals, an allowance for voltage drop in long cables, live rails and collectors must be considered. These voltage drops are significant when motor is operated at pull out point, since current at this point is much higher than the rated current. Pull out torque is maximum for 300 starts/hour class. This high pullout torque ensures rapid acceleration irrespective of drop in effective torque due to stepped rotor resistance. However, care to be taken that gears and other drive transmission equipments can withstand this peak torque. The motors can withstand 1.5 times the rated current for 2 minutes without suffering damage. This feature makes the motor suitable for severe duties experienced on the crane or similar applications. Crompton Greaves crane duty motors are designed and manufactured with carefully selected and tested insulating materials to ensure long services. The life of the motor mostly depends upon the life of the insulating materials since bearings, brush gears, slip rings etc. can be replaced easily during normal maintenance. All 4, 6, 8, and 10 pole motors are designed for withstanding an over speed of 2.5 times rated synchronous speed or 2000 rpm whichever is less. 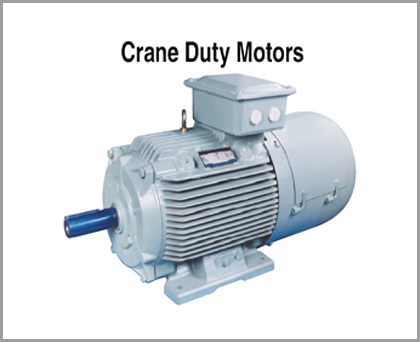 Crane duty squirrel cage motors when used with inverter drives give better current control, speed control & improved operation. Current control is similar or better than slip ring motors & maintenance cost /efforts are less than equivalent slip ring motors. Current control of VFD driven motors is better than standard squirrel cage motors. ⇒ Vacuum pressure impregnation of stator winding, this gives less voids & stronger winding. ⇒ Strengthened insulation system for withstanding voltage stresses. ⇒ High frequency in the range of 3kHZ - 6 kHZ. Voltage rise time> 0.1 sec. ⇒ Voltage spikes up to 1600V and rise time of 0.1 sec. In case of cranes/hoists, the mode of operation is constant torque. The typical speed range is from 10% to 100% of synchronous speed. The speed during lowering cranes in unloaded conditions may be more. The limiting speed should not exceed 2.5 times of rated synchronous speed or 2000 rpm whichever is less. 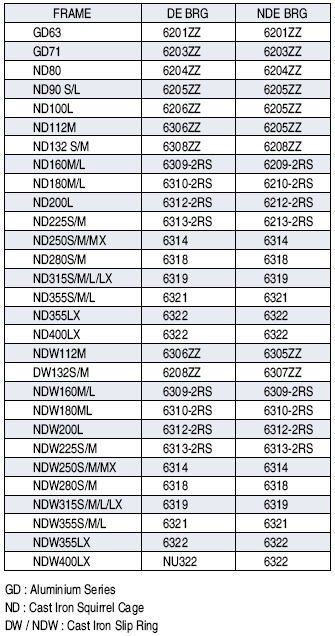 The selection of frame size for various duty type & starts shall be as per table enclosed. For higher cable length from drive to motor, use suitable dv/dt filters & a lower switching frequency. Use of insulated bearing at non driving is recommended for frame size above 315 to reduce bearing failure due to shaft currents. Use of thermisters for frames upto 250 & resistance temperature detectors for frame 280 & above is recommended. Harmonics of voltage & current in a cage induction motor supplied from a converter cause additional iron & winding losses in the stator & the rotor. There is no simple method to calculate the additional losses & no general statement can be made about their value. When the motor is tested with converter supply at rated load, base voltage & base frequency, the permissible temperature rise will be within the limits of the insulation system used. For example when a motor havinf class F insulation system is tested with sinusoidal supply at rated voltage , rated frequency & rated load, may have temperature rise within class B limits. However, when the same motor is tested with converter supply under same test conditions, the temperature rise will be within class F limits. It is assumed that, while testing with converter supply, the HVF factor of converter output supply, is maximum 3%. 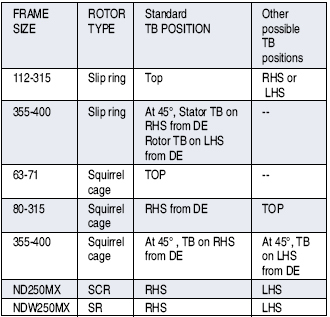 Hence the outputs of crane duty inverter driven motors are as listed in the table on page 28-30. All additional general requirements like accessories, paint shade, insulation class, degree of protection, voltage and frequency variation shall be available at extra cost. The cost structure of extra features is same as that for standard motors. 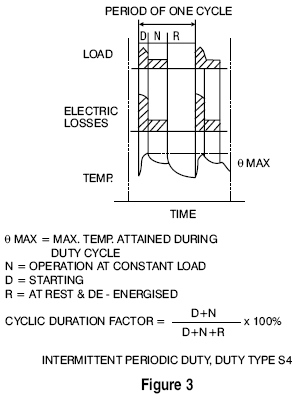 Operation of the motor at load including no load and de- energised period to which the motor is subjected, including the sequence and duration. The ratio between the period of loading including starting and electric braking and the duration of the duty- cycle expressed as percentage. The process of energizing a motor to bring it upto rated speed from rest. This is an incomplete start during which the motor does not attain more than 25% of the rated speed. A system in which a braking action is applied to an electric motor by causing it to act as a generator. A form of braking of an induction motor in which a separate dc supply is used to magnetise the motor. A form of electric braking of an induction motor obtained by reversing the phase sequence of its any two lines. A system of electric braking in which energy is returned to the supply system. i) Frequency of starting (starting class). iv) and the inertia of the motor and the load. The starting classification for a motor indicates the maximum permissible number of starts per specified inertia, taking into account complete starting, jogging or inching and electric braking. Rating for the commonly used starting, i.e. 6,150 and 300 starts/hour class, are listed in this publication. However, following factors can be used to calculate output rating for different number of starts and CDFs. Operation at constant load during a given time, less than that required to reach thermal equilibrium, followed by a rest and de- energised period of sufficient duration to re-establish machine temperatures within 2Â°C of the coolant. 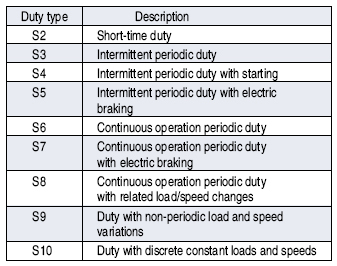 (See figure 1) The recommended values for the short time duty are 10, 30 and 90 minutes. A sequence of identical duty cycle, each including a period of operation at constant load and a rest and de-energised period. These periods being too short to attain thermal equilibrium during one duty cycle. (See Fig. 2) In this duty type, the starting current dose not significantly affect the temperature rise. 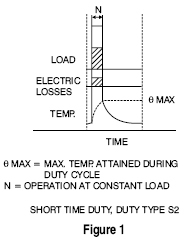 Unless otherwise specified, the duration of the duty cycle is 10 inutes. 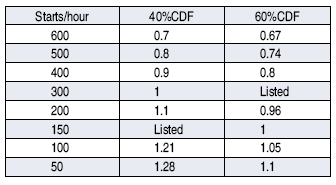 The recommended values for the CDF are 15, 25, 40 and 60 percent. 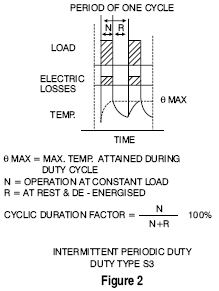 A sequence of identical duty cycles, each cycle including a significant period of starting, a period of operation at constant load and a rest and de-energised period. These periods being too short to attain thermal equilibrium during one duty cycle. 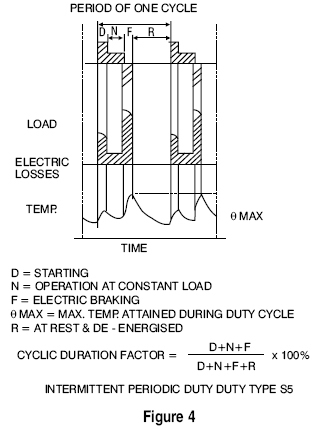 (See Figure 3) In this duty, the stopping of the motor is obtained either by natural deceleration after disconnection of the supply or by means of braking such as mechanical brake which does not cause additional heating of the windings. A sequence of identical duty cycles, each cycle consisting of a period of starting, a period of operation at constant load, a period of rapid electric braking and rest and de-energised period. The operating cihd rest and de-energised periods being too short, to attain thermal equilibrium during one duty cycle. (See Fig. 4) Note : In all above types of duties, the loading period and rest period of the cycle are so short that the steady state temperature is not reached. While working on these identical cycles continuously, the motor temperature rise must not exceed the permissible values for a given class of insulation. Kw = one hour power rating for dc motors & power rating at (8 - 40%) cyclic duration factor for ac motors. Camb = Derating factor for ambient temperature as per table 1.